← “If you are not on offense you are on defense.” So… what’s next? In light of Nancy Pelosi’s latest (but consistent) scandalous betrayal of Catholic identity I introduce my Can. 915 series coffee mugs and other swag. See what she’s done this time. HERE. Here is the basic image for the mug and for the shirts, etc.. Here is one view of the mug. Here is the other view. I am revamping my various stores to make it easier to find stuff, consolidating them into one main store with various “sections” HERE. The Religious Liberty series is coming soon! This entry was posted in 1983 CIC can. 915 and tagged can. 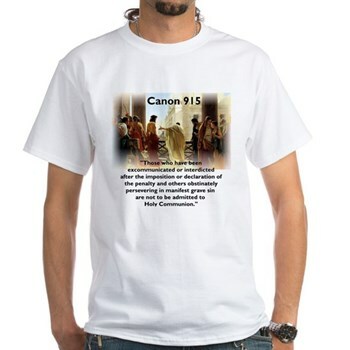 915, coffee mugs, Holy Communion, Nancy Pelosi, Pontius Pilate. Bookmark the permalink. Nice design. 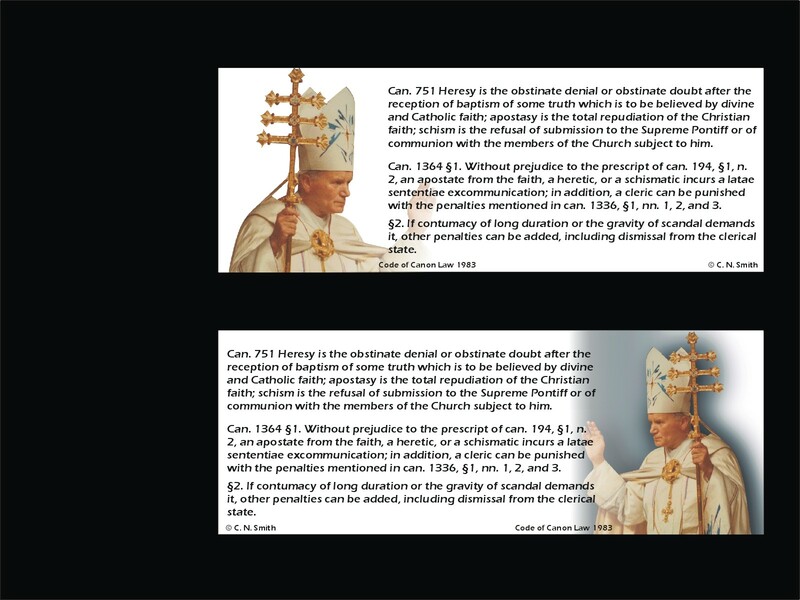 It would be cool to have a series of mugs with some key quotations about liturgical abuse and the rights of the faithful to a Mass which observes the norms. One thing at a time, friend. Mug by mug. Andrew: As tempting as that is, I think the image on the mug and swag is pretty compelling. How very pre-Vatican II of you. I love the mugs, and will probably have to own one. And maybe buy some for gifts. Hmmmmmm…. Perhaps a gift to my Archbishop? Very cool, indeed-both the mug and the t-shirt! Is there any way to get a discount for bulk ordering (I’m talking like 10 or 20 mugs)? Same goes for any of the merch in your store. Good question. I am not sure! Lemme look around on the site and see if I can find something about that. Otherwise, there may be a workaround.